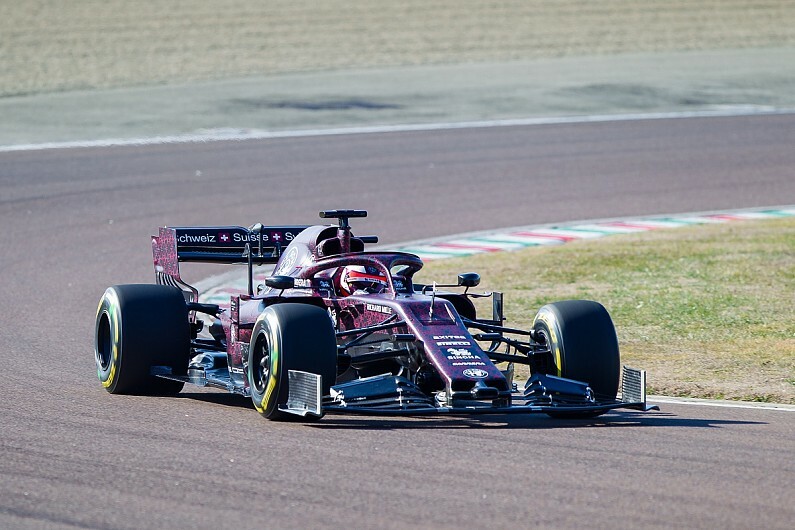 Alfa Romeo Racing’s 2019 Formula 1 car has been pictured on-track for the first time at a shakedown in Italy. The team, which has taken over the branding of Sauber’s 2018 entry, is using one of its two allowed promotional events to run the car ahead of pre-season testing next week. These first images from Fiorano – captured by a Motorsport Network photographer – reveal Kimi Raikkonen behind the wheel of the Alfa, which has appeared in a black-and-red camouflage livery. The colour scheme incorporates hearts, as the car has appeared on Valentine’s Day, and Alfa’s Quadrifoglio shamrock that it uses to identify its high-performance models. Alfa’s new F1 car has not yet been named. It is due to be unveiled officially next Monday, before testing begins at Barcelona.